For 2013 the Knorr-Bremse stand at Railtex 2013 will be dominated with a huge screen demonstrating the huge portfolio of rail systems and services made locally available by Knorr-Bremse in the UK. There will also be a wide range of examples of the Knorr-Bremse Rail Group’s innovative technology on display on the stand, all designed to offer customers safety and high performance whilst reducing life cycle costs. In the area of brake control these include the new EP1001 wheel slide protection system especially designed for freight applications and a new enhanced version of the well proven EP2002 distributed brake control system which has been so successful in operation on metro and main line trains throughout the world. For 2013 the Knorr-Bremse stand also sees the UK launch the new, innovative Knorr-Bremse Z-300 system which monitors train on-board systems including HVAC and doors operation and facilitates remote adjustment and pre-emptive maintenance to keep trains in service. IFE, the Knorr-Bremse Rail Group’s train door specialists are showing their retrofitted obstacle detection system using a special interactive display. There’s nothing new in obstacle detection but IFE use take an innovative approach to providing this retrofit solution. Visitors to the Knorr-Bremse stand will be able to have some fun "driving a train" for themselves using the Group specialist’s Sydac full size driver simulator. Running on the simulator will be the Knorr-Bremse LEADER driver assistant system which helps the driver to lowers the energy used by the train and reduce emissions and wear whilst maintaining operational headways. 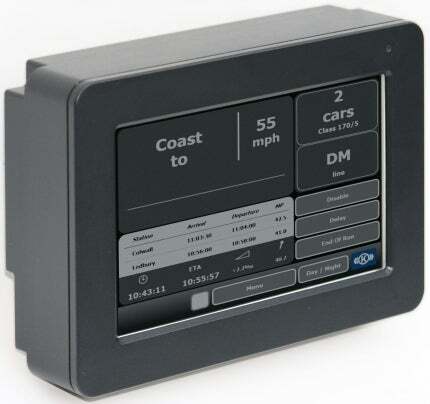 Railtex marks a milestone for this system as is has just been announced that the Go-Ahead Group has awarded Knorr-Bremse two contracts, the first in the UK, to fit the state-of-the-art driver assistant system on the diesel train fleets of London Midland and Southern. The LEADER System is now being installed on 23 Class 170 DMUs and 27 Class 172 DMU trains operated by London Midland and 16 Class 171 DMU trains operated by Southern. In all, 132 LEADER cab sets are being supplied. Installation and commissioning of the LEADER systems on both fleets is due to be completed by autumn 2013. In addition to the new products and systems on the stand there is a display under the Railservices brand, featuring an example of a caliper dramatically showing its changed appearance half, "as received" and half, "as overhauled" back to OE safety and performance standards. Knorr-Bremse Railservices offers a huge range of flexible support and services which cover everything from original parts supply to full, whole "train life" systems support.